« $0.55 ANY EGGS coupon! Rare, So Hurry and Print Before it’s Gone! 1. 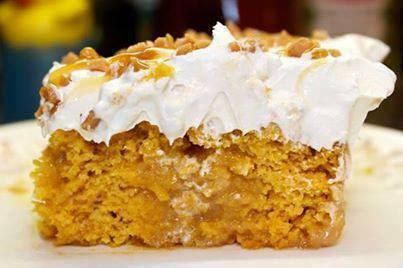 In a large bowl, mix together the cake mix and pumpkin puree until a smooth batter forms. 2. Pour batter into a greased 9×13 baking dish, and bake at 350º, according to the directions on the cake mix box (approx. 23-28 mins). 3. Remove cake from oven and let cool for about 10 minutes after baking. 4. Using the end of a wooden spoon to poke holes all over the top of the cake. 5. Pour the sweetened condensed milk over the cake. This should fill in the holes and soak into the cake.